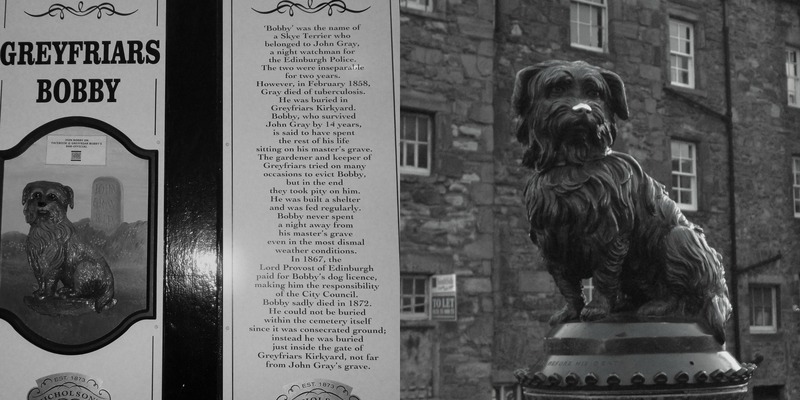 *Greyfriars Bobby was a Skye Terrier who became known in 19th-century in Edinburgh for spending 14 years guarding the grave of his owner until he died himself on 14 January 1872.The story continues to be well known in Scotland through several books and films,and a prominent commemorative bronze life-size statue on a granite fountain in Edinburgh. *In 1850 a gardener called John Gray arrived in Edinburgh and as he was unable to find work as a gardener,he joined the Edinburgh Police Force as a night watchman.He also took on a partner,a diminutive Skye Terrier,his ‘watchdog’,called Bobby,to keep him company through the long winter nights. Together,the two faithful friends,John and Bobby, became a familiar sight trudging through the old cobbled streets of Edinburgh. 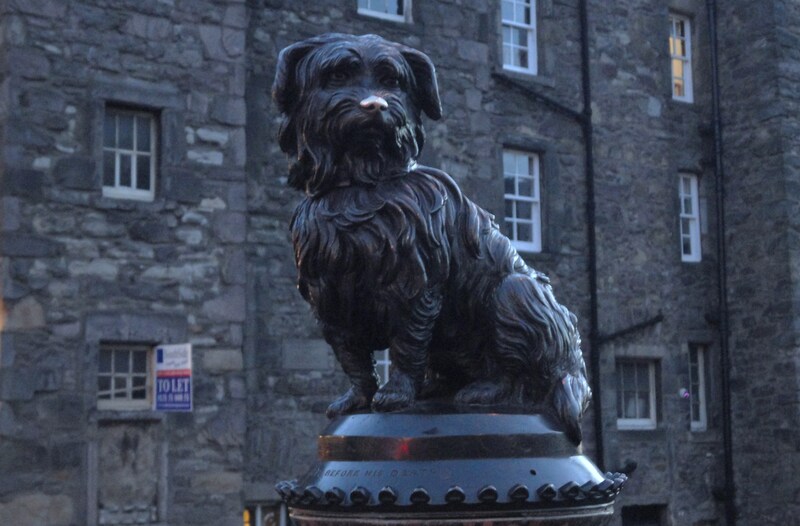 * William Brody sculptured the statue from life and it was unveiled in November 1873, opposite Greyfriars Kirkyard.It is with that,that Scotland’s Capital city will always remember the famous and faithful dog. * A red granite stone was erected on Bobby’s grave by The Dog Aid Society of Scotland, and unveiled by the Duke of Gloucester on 13 May 1981.Since around 2000 it has been treated in a shrine-like manner,with sticks, for Bobby to fetch,dog toys and flowers. 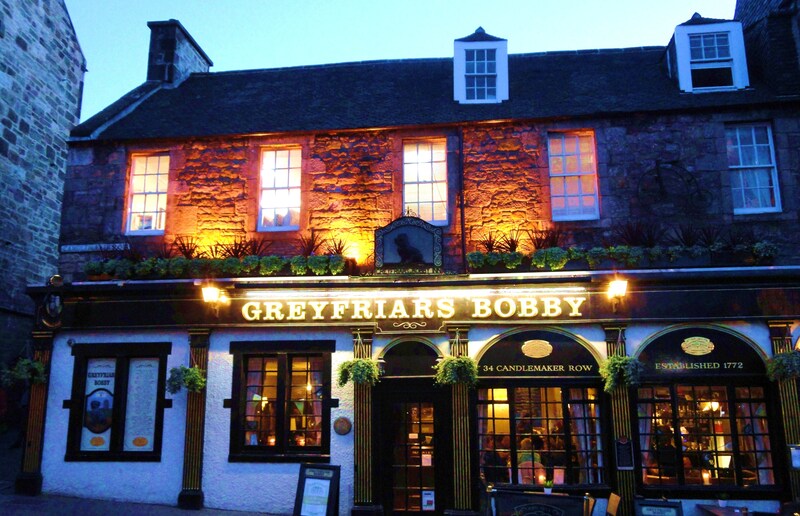 Greyfriars Bobby Pub with the statue of loyal hound Bobby outside and just round the corner from the graveyard where the famous Skye terrier would lay down beside his master’s resting place. Here it is again Doda, not sure what I did on photobucket! yayy!!! you are most welcome! A great Eureka Eureka moment 🙂 Thaaaaaank You !!! Outstanding story of love and loyalty. A message we can all learn from. Thank you for sharing. Thank you so much for appreciating it,my friend!Blessed those who receive dogs’ unconditional love and loyalty and have real animal love. 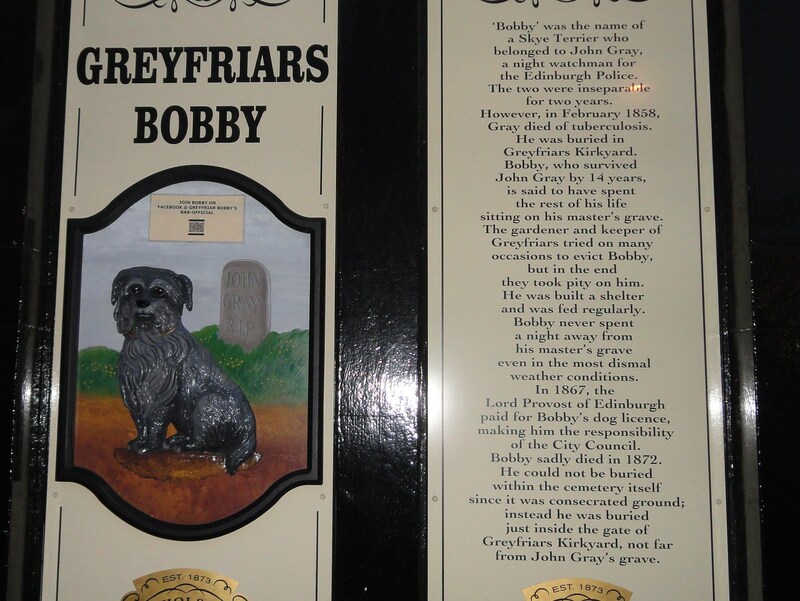 It is the first time I hear the story about Greyfriars Bobby and see the statue in its honour. Truly a mans best friend! Thanks for sharing. Oh Doda this is my favourite pub in Edinburgh!! Great minds think alike! I did a series of posts on Bobby for the One Four Challenge! I love this post and here is the first I did in a photographic series of four. 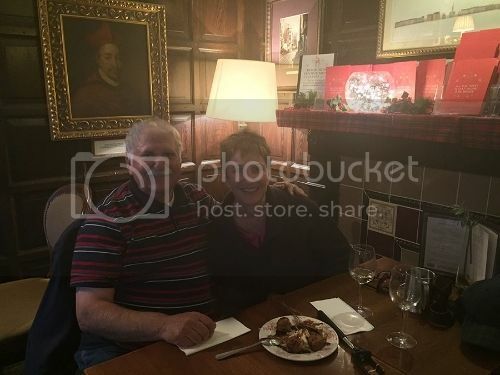 Yeah,dear Cybele!Thaaaaank You so much for the link,I was on holiday and had missed it.Each time I am in Edinburgh I am moved by Bobby’s story as if it were the first time I get to know him …. and thank you for the lovely reply and video!!! It is so touching!!! yes raise a glass to us all and Bobby!! oh yes!! we both love!! I have heard tell of this story of Bobby Doda, but had not seen the statue or the pub… 🙂 you have seen something I have not. 🙂 and although we have always kept cats here, we are pet-less at the moment.. A lovely little terrier would make a great Loyal companion,..
It’s an interesting and touching story, dear Doda, thanks for sharing. And lovely pictures too. I like the look of that old pub building. Yes,dear Jet,it would be really lovely to have a glass of beer in this pub while listening to Bobby’s song …. Have a quick look at this newspaper article …. A lovely story Doda, and one I had not heard before; although there are many tales of dogs remaining beside their ‘owners’ grave of course. It is a gruesome thought, but Bobby will almost certainly have been able to smell Gray’s body right throughout the lengthy decomposition process. Yes,dear Hariod,there are many similar stories written and unwritten.I’ll never forget how Karolos Koun’s dog died. After Koun departed,his dog was sitting on his master’s coat without eating and died from grief within fifteen days. My heart’s in the Highlands wherever I go….